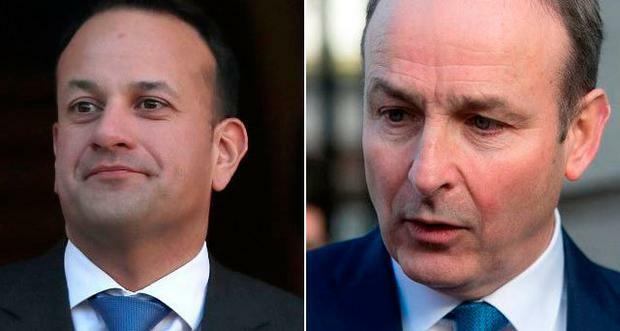 A NEW confidence and supply deal between Fine Gael and Fianna Fáil could be concluded within days, Micheál Martin has indicated. The Fianna Fáil leader told a private party meeting tonight that the Brexit situation is “very serious”. The Taoiseach met with Fianna Fáil leader Micheal Martin tonight to discuss confidence and supply and Brexit. They will meet again in the coming days. The parties differ on how long an extension should last but well-placed sources suggested it is likely to be in the region of a year. Mr Varadkar has said he does not want an election before summer 2020. Fianna Fáil sources confirmed to Irish independent that Mr Martin received the support of attendees at tonight’s parliamentary party meeting to take discussion “to the next stage”. Teams from both sides have spent the past six weeks reviewing the 2016 deal which committed Fianna Fáil to facilitating the passage of three budgets. The party’s deputy leader Dara Calleary updated colleagues on this process which included briefings from senior officials in the departments of health, housing, finance and communications. Mr Martin noted that serious issues had been identified in a number of areas, particularly the Government’s performance on housing and health. The Cork TD also said Fianna Fáil was already getting credit for putting the country first during a turbulent political period. “He chose his words carefully. He believes we have to responsible. He didn’t commit to a new deal but it’s clear that’s the direction of travel,” said one source. As of last night, Mr Varadkar had not received a request for a meeting but he is understood to be open to one. Government sources played down the idea of a swift conclusion though, noting that British Prime Minister Theresa May is in Dublin tomorrow and Mr Varadkar is attending an EU summit in Brussels on Thursday. Some work is understood to be complete on the content of a new deal but sources on both sides say it is far from finished. “It isn’t technically an extension to the deal, it’s will be a whole new arrangement,” said a source. Neither Brexit nor broadband featured in the original document which focused heavily on the abolition of water charges. Fianna Fáil has been largely supportive of the Government’s approach to Brexit but have raised major concerns over the handling of the National Broadband Plan.